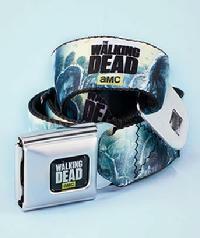 Item #95596 The Walking Dead Belt with Buckle$34.95 ea. In Stock This new officially licensed The Walking Dead belt with belt buckle is full color, with metal car seat type of buckle, belt made of nylon, adjust from 26 1/2" to 45" brand new never been warn, comes poly bagged. Item #02122 The Walking Dead-Rick Fleece Throw $27.95 ea. 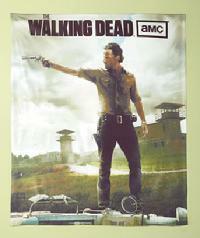 In Stock This new officially licensed The Walking Dead-Rick with logo fleece throw is 50" by 60" square, the 3rd. season poster with Rick, full color, only have a few available, machine washable. Item #HB-03 The Walking Dead-The Governor Handbag $39.95 ea. In Stock (HAS BEEN DISCONTINUED) This officially licensed, The Walking Dead handbag has zombies and logo on both sides of the bag, is white and black, has zipper closure is about 11 1/2" long by 8" tall, straps are 7" long, only have a few available, has blood red interior, zipper closure, along with velcro closing pockets, based on the original comic book artwork. Item #MO-BRIDE The Bride of Frankenstein Metal Face Belt Buckle $24.95 ea. In Stock This officially licensed Bride belt buckles are made of zinc, and fits 1 1/2" belts, very detailed, about 3" wide X 4" high, the perfect gift for the horror fan in your life, only a few available. 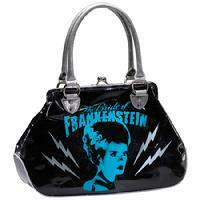 Item #MOHB-BRIDE Blue Bride of Frankenstein Handbag $59.95 ea. In Stock(HAS BEEN DISCONTINUED) This officially licensed Bride of Frankenstein handbag is leather, has metal clasp closure, is black and blue, has the Bride on one side of the bag, bag is about 16" W X 10" H X 3 1/2" D, strap is about 16". Item #14324 Vandor- I Love Lucy Metal Alarm Clock $24.95 In Stock (ONLY HAVE 1) This officially licensed I Love Lucky metal alarm clock is near mint, comes in an opened white cardboard box with the I Love Lucky logo, clock has a full color picture of Lucy & Ethel, clock body is all metal with a chrome finish, clock is about 5 1/2" tall from base to top of bells, by 4" wide X 2 1/4" thick included stand. 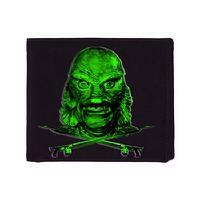 item #MOW-CREATURE-W Creature from the Black Lagoon Leather Wallet $19.95 (ONLY HAVE 1) In Stock This Creature from the Black Lagoon leather wallet is officially licensed by Universal, 5 card pockets, bi-fold wallet, creature in green on front and back of wallet, comes carded, has Creature from black lagoon logo in green on the inside of wallet its about 4" x 3 1/2" when folded, also has an eyelet for chains. Item #MO-MUMMY The Mummy Belt Buckle $24.95 (ONLY HAVE 1) In Stock This Mummys (Boris Karloff) face belt buckle is near mint, never been worn, is about 3" wide by 4" high, made of zinc, very detailed, made to fit 1 1/2" belts, officially licensed by Universal. Item #MO-WOLFMAN The Wolfman Belt Buckle $24.95 ea. In Stock This Wolfman (Lon Chaney Jr.) face belt buckle is near mint, has never been worn, made of zinc and is about 3" wide by 4" high, made to fit 1 1/2" belts, highly detailed, officially licensed by Universal. Item #RR-BELA Classic Count Dracula Belt Buckle $24.95 ea. 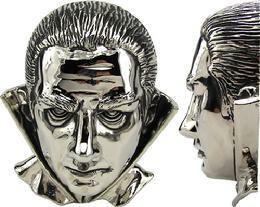 In Stock This new Dracula (Bela Lugosi) officially licensed face belt buckle is zinc plated, imported, is about 3" wide X 4" tall, with great detail, fits 1 1/2" belts, also includes part of his capes collar. 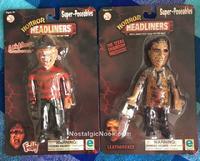 Item #369074-76 Horror Headliners- Super Poseable Bendie Figures $24.95 ea. In Stock These 2000 Horror Headliners Bendie figures are near mint, still sealed on a near mint backer card, your choices are The Tx Chainsaw Massacre Leatherface (ONLY HAVE 1) or Nightmare on Elm Street- Freddy only have 2, each figure is full color and is about 5 1/4" tall, Leatherface comes with a chainsaw and Freddy comes with his glove.